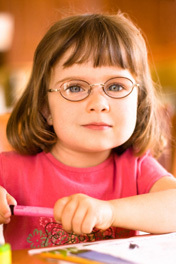 This new Illinois law requires comprehensive eye examinations for children entering kindergarten or enrolling for the first time in public, private, or parochial elementary schools in Illinois. It requires eye exams within one year prior to kindergarteners staring school in the fall and for all students entering a school in Illinois for the first time. Students must provide proof of the required eye examination to the school by October 15 of each school year. If a student fails to submit proof of the eye exam by such date, the school may withhold the child's report card. For the complete Public Act 095-0671, please visit preventblindness.org/news.